LSLL’s Camryn Ehlers fires a pitch towards the plate during Sunday night’s District 3 opening contest against Georgetown. Ehlers finished with a perfect game, including five strikeouts, in LSLL’s 14-0 win. Pitcher Camryn Ehlers fired a perfect game for LSLL, with five strikeouts. After a slow start to the game, LSLL exploded for 12 runs in the third inning. Destiny Mitchell had a pair of doubles and scored two runs out of the leadoff spot for LSLL. Lily Hoban, Laniya Lewis and Jaya Shaub all scored two runs apiece. Katie McHale came across the plate three times for the winners. Lewis, Shaub and McHale each had a pair of hits as well. “It was a great game, perfect game,” head coach Sarah Hoban said of the win. 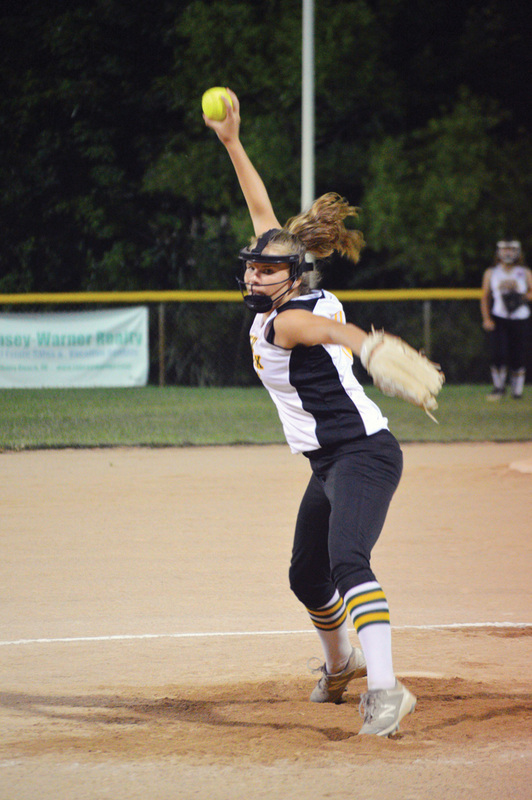 “Camryn pitched great, and the defense made the plays behind her. Timely hits, and the girls really played well. Total team effort, and so proud of all the girls. LSLL faced Millsboro in the winners’ bracket on Monday night, and cruised to another win 12-2 in five innings. They were set to face Laurel/Nanticoke — a 13-2 winner over Cape — in the winners’ bracket final on Thursday evening, July 5, after Coastal Point press time. Results of that game will be posted to the Coastal Point sports Facebook page. The winner of the district tournament moves on to the state competition, which is scheduled for July 11-15. The state tournament for the 8- to 10-year-old softball division will start on July 17, while the Junior division begins on July 11. In baseball action, LSLL’s Senior team cruised through its bracket with three straight wins, including a 17-5 rout of Georgetown/Cape in the finals. LSLL opened with a 4-3 win over Laurel/Nanticoke last Wednesday, June 28. Then, on Saturday, June 30, they defeated Georgetown/Cape in the winners’ bracket final. The Georgetown/Cape entry had to defeat Laurel/Nanticoke for a rematch with LSLL and did just that with a 4-3 win. LSLL advances to the state tournament, where they will open up play on Monday, July 9. The state baseball tournament for 8- to 10-year-olds begins on July 24. The Major division will take place July 23-28. The Junior division will see action July 24-29, and the Senior division will run July 9-14.